LA-based rock-alt band DREAMERS recently released their much-anticipated debut LP, This Album Does Not Exist. Ethereal and upbeat it incorporates “themes of existence and existentialism, but it’s easy enough to get sucked into their world and dance the big questions away. They’ll be bringing their jams to Boston at The Sinclair with The Griswolds on February 26, but before they hit the stage we had a chance to catch up with front man Nick Wold about his inspirations and experience breaking into the music world. Maddy Ball: Hey Nick, thanks so much for chatting! We’re stoked for you to come perform in Boston…how’s the tour been so far? Nick Wold: It’s been great. Last night was show number one so we’re just kicking it off here. Show number one in Seattle was awesome and I can’t wait for the rest of the tour. MB: Oh wow, Seattle is another great music city. NW: Yeah! It’s actually my hometown so that was pretty cool. I stayed at my parents house (laughs) and I had a bunch of family come to the show. It kinda became an event. MB: Awesome. Alright I guess I’ll just hop in. So I know there was a little bit of a path to get where you are today. Could you talk about how you got in to music to begin with? NW: All of us have been playing music in different ways since we were kids. I actually played saxophone when I was little. I was really serious about jazz, which is what brought me to New York. I went to NYU for jazz and later transitioned into wanting to be in a rock band. I grew up listening to, like, the Beatles and grunge rock in Seattle from my older sister. MB: What bands have you been in? How did DREAMERS start? NW: Yeah that was all in New York. I started out in a band that ended up breaking up. DREAMERS was sort of the 2nd draft, with the same manager. We started fresh, learning from our mistakes and hopefully doing it better the 2nd time around. MB: Absolutely. Actually, a lot of what we do at Sound of Boston is related to new, local artists. Could you talk a little more about what it took to break into the music industry and decide to form a new band? NW: It’s definitely a grind. A slow climb, chipping away at the mountain. Trying to get your word out there and get recognition. For me, I think the interpersonal vibe of a band is one of the most important things. Our first band didn’t have that as much, we had to make too many compromises. I think we just had to find people that had the same goals. If I could give any advice, that would be it: to find people who share the same mission and stick with them. MB: And the name, DREAMERS—I read your manifesto on your website. How did that come to be? NW: We’re all about philosophy: it taught us how to live. People like John Lennon and Kurt Cobain are big influencers. With a name like DREAMERS, we wanted to make a statement about living life and our philosophical take on it. MB: Now, on to the music: without using genre names, how would you describe your sound? NW: The sound… of angels…. making love. (Laughter) No, just kidding. To be honest all the great rock from the 60s, 70s, 80s, 90s, we wanted to continue the common thread of great, righteous rock from all the decades. We try to take all our favorite stuff and wave that flag or carry the torch in our own way. MB: In your music, is there any group or artist that provides the most inspiration? NW: Sort of fittingly, we get a lot of inspiration from Dreams. That’s a big one and also kind of why we named the band the way we did. 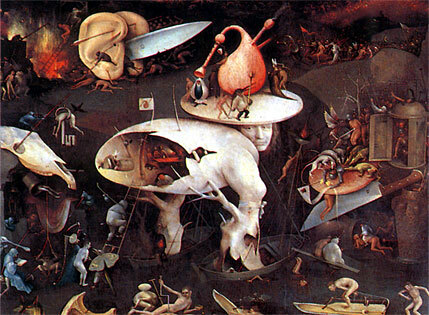 We love poems, we’re really into surrealist art like Dalí and Hieronymus Bosch. MB: What draws you to that type of inspiration? NW: I’m not 100% sure. I guess I think about perception and dreams and experiences. I like art that really steps out of normal, bland subjects. I’ve always been drawn to stuff that is silly and playful. It’s a good way to explore emotional things and other life experiences. MB: Now, I know you guys have been crazy busy (releasing new music, touring, etc.) but when things settle, where do you see your next moves being? NW: Yeah, we’re actually always writing and trying to keep new ideas coming. We just had a whole month in LA (which is rare) so we had some time to write. We want to just keep kinda bringing the rock. We’re turning up our love for early 90s grunge rock (Nirvana, etc.) That whole world is kind of our current obsession. MB: Okay, speed round: Favorite tour road snack? NW: Great question as I actually have a big sack of snacks in front of me right now. Pistachio nuts. They’re my jam. They can substitute a meal and also give you something to do. Makes you work for it so you don’t get lazy. And I love jalapeño kettle chips. MB: One thing you couldn’t live without while touring? NW: My bros. (Laughter) No but seriously, my awesome crew. I’ve toured with some people that I don’t get along with as well and it is a totally different experience. MB: Current guilty pleasure jam? NW: I kind of have less and less guilt all the time about just liking pop music. My go-to is Katy Perry cuz she’s my girl. And I am a fan of Taylor Swift too. But Katy Perry, she’s just a ray of light and a great singer. I’m all about it. MB: We’re so excited to have you in Boston! Is there anything you’re particularly looking forward to coming here? NW: Yeah! We always have a great time. We have fans there that keep coming back every time. We’re just excited to see that fan base grow and grow. Especially as radio stations catch on and slowly, yet surely… not… hate us. MB: Haha. Well, we can’t wait to have you come out, thanks for taking the time to chat. NW: Of course! Come say hey if you’re at the show. DREAMERS will be opening for The Griswolds February 26th at the Sinclair. Doors open at 7 PM, be sure to stop by early to not miss out!